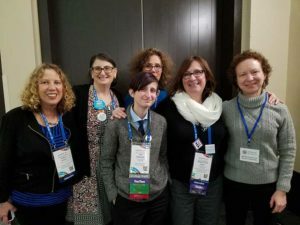 Six members of TEMV participated as a “Platinum Delegation” to the Union for Reform Judaism (URJ) Biennial in Boston this past week. The biannual event is among the largest Jewish gatherings in North America, with nearly 6,000 attendees coming together to worship, learn, sing, build community, and shape the future of the Reform Movement. Registrants attended workshops around the themes of diversity, innovation, and action, and heard keynote speeches and plenary sessions from speakers including Charlie Baker, Governor of Massachusetts; Rev. Dr. William J. Barber, II, founder and president, Repairers of the Breach; Fran Drescher, actor; and Elizabeth Warren, U.S. senator from Massachusetts. Leading American Jewish composers and musicians musicians also performed throughout the event. Several additional members of the TEMV community joined our delegation for the Friday night Shabbat service that drew thousands of participants. Led by Rabbi Jeffrey Sirkman, senior rabbi of Larchmont Temple in New York, with Cantor Sheera Ben-David from Temple Sholom of Chicago and a d’var Torah by URJ Vice President for Audacious Hospitality April Baskin, the services also included a band and choir and inspired many attendees to dance joyously in the aisles. Videos of many of the talks, services, and performances may be viewed at the URJ website. TEMV’s delegation looks forward to sharing more of the learnings and energy from this experience with all of the TEMV community.